It was the height of the British Empire. From London, Queen Victoria ruled over large parts of the world. Riches flowed back to England from India, the Caribbean and numerous other colonies. Global trade routes made industrialists hugely wealthy, while the aristocracy were able to make the most of their inherited wealth. However, there was a darker side to 19th century London. Starting in the middle of the 1700s, large numbers of people had been flooding into the big city in search of a better life. What they found was poverty and misery, especially in the slums they were forced to call home. Many of these slums were located in parts of London that are highly fashionable today. Spitalfields, just to the east of the centre, is these days home to hip designers and artists, while what were once the slums of Holborn are now home to big businesses in the fashionable West End. It’s hard to imagine just how grim life was here in Victorian times. Rising populations meant that demand for accommodation skyrocketed – and people would do almost anything to have a roof over their head. Families lived side-by-side in abject poverty. 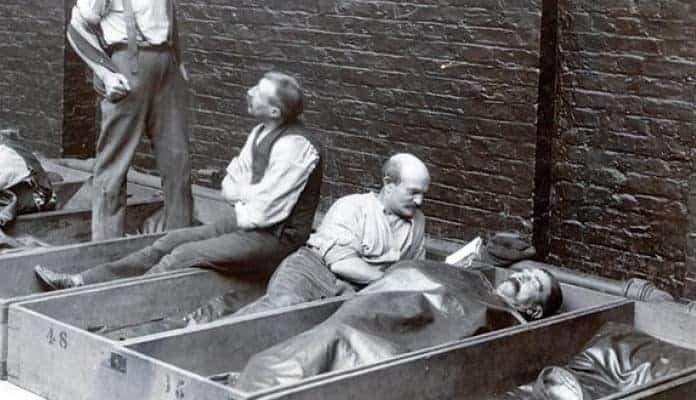 Violence, abuse and disease were all part of everyday life in London’s slums, and desperate times called for desperate measures. London’s slum buildings were built as cheaply as possible, and their occupants suffered. Wikipedia. 20. Slum landlords could only lease land for 21 years – so their buildings were never built to last. Most slums were made up of large houses, or tenements, divided into individual rooms. Almost all of them had been hastily erected to cash in on the population boom of the early 19th century. Enterprising – and greedy – businessmen built on marshy meadows that had previously been used as market gardens, with the clay ground long regarded as unsuitable for building on. Notably, the city regulations meant that parcels of this land could only be leased for 21 years at most. As such, builders had zero incentive to make sure the ‘homes’ they built would last longer than this. To begin with, slum buildings had no real foundations. They were highly unstable, and would often collapse, usually with fatal consequences. This short-term thinking and rush to cut costs as much as possible also meant that the walls were just half-a-brick thick. Needless to say, such thin walls offered no protection from the elements and would often simply collapse. Despite the shoddiness of the buildings, many of the original developers put their names to them, and these names stuck. For more than 100 years, many of London’s worst slums, including Tomlin’s New Town, were named after the greedy investor who first built on marshy land.